Last weekend, I traveled up to John Dayhuff's place in Battle Creek, MI with my friend Zespy to pick up a new pinball for him, a Williams Grand Lizard. We left early so we could hang and play with John all day on his 70+ pinball machines, which we did, literally until my hands hurt. It was awesome. While I was there, I played two early Stern titles, namely Viper and Iron Maiden. Both were so fantastic, I played them for the majority of the 9 or so hours we were there, rarely leaving that corner of the basement. On the way home I kept thinking and talking about how much I loved playing those early Stern titles and asked him to see if one might be available somewhere, somehow. 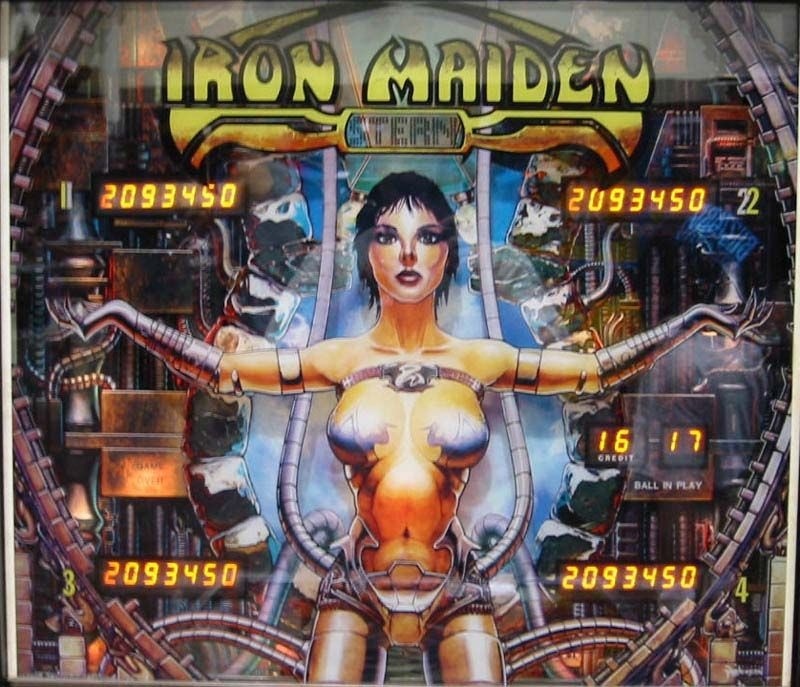 Now, early Sterns are really sought after and pretty rare, especially Iron Maiden. The production numbers were never published, with guesses between 400 and 1200 and most ended up going to Germany, with a smaller amount staying here on home soil. Zespy checked all the forums while we were driving home and couldn't find anything for sale. 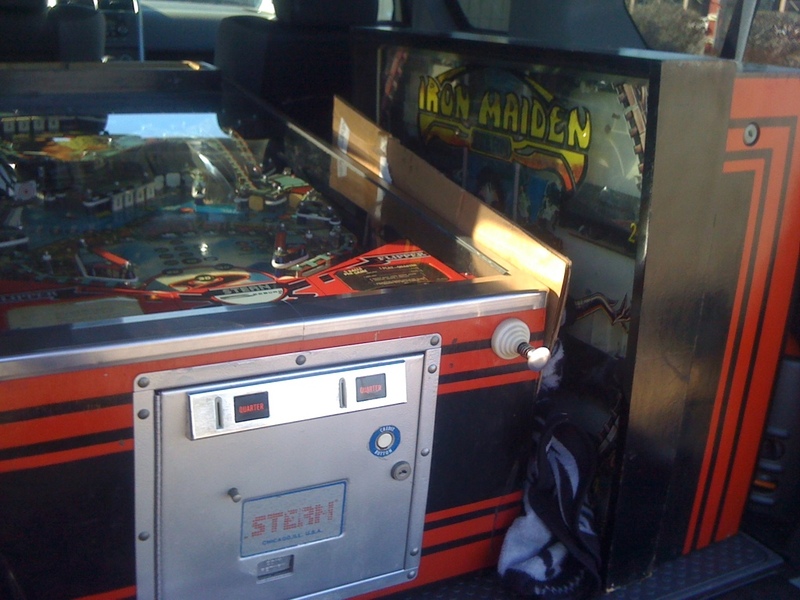 I asked him to check the Pinball Owner's Database as people can list their collection as well as which ones they might sell or trade away. 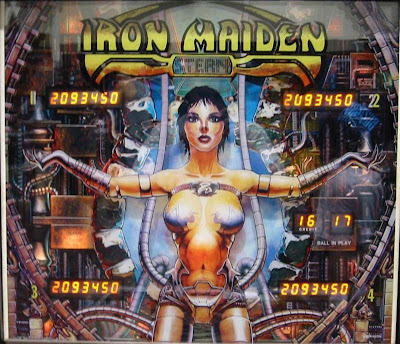 There were only two Iron Maiden's listed in the US - one for $5,500 in MA and another in Hilliard, OH, not working, but available for trade. I emailed him when we stopped at a Denny's for some dinner, my excitement reaching fever pitch. I heard back the next morning. He was interested in a trade, taking my Big Guns for his Iron Maiden straight up. We worked out a deal in a few hours, with my interest skyrocketing when I saw the condition of the game. 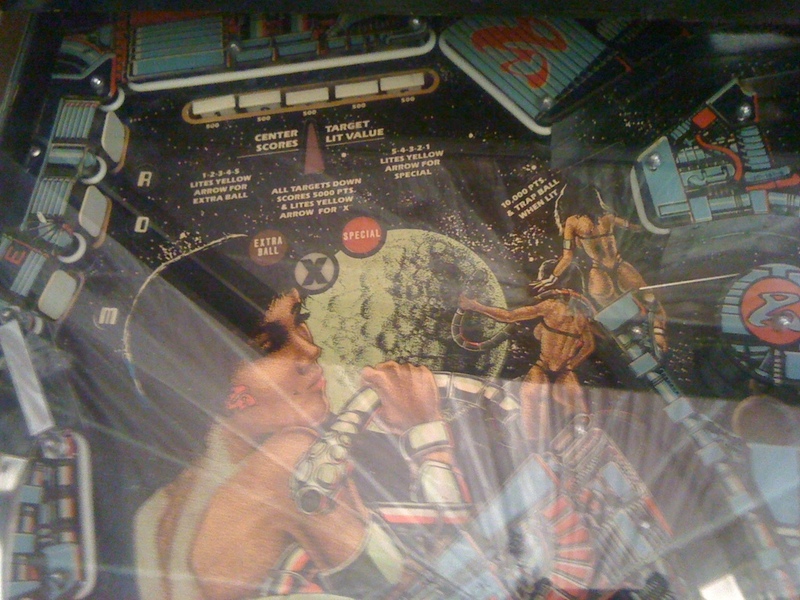 It was damn near the most mint I have ever seen a pinball machine - barring the second back glass (it has two for a psuedo 3D effect) which was pretty well devoid of any graphics as they flaked off. 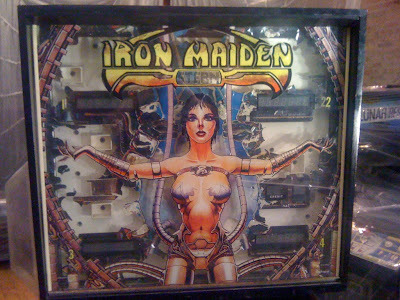 It was a stellar deal - my Big Guns straight up for the Iron Maiden. Awesome. I committed to the trade, loaded up the Big Guns and took off at 6 am on Saturday morning for the 12-hour drive there and back with Zespy. The backglass as its supposed to look below and mine above. I couldn't believe just how nice the machine looked - no cabinet wear, no playfield wear, even around the inserts and besides the backglass, it was in mint shape. 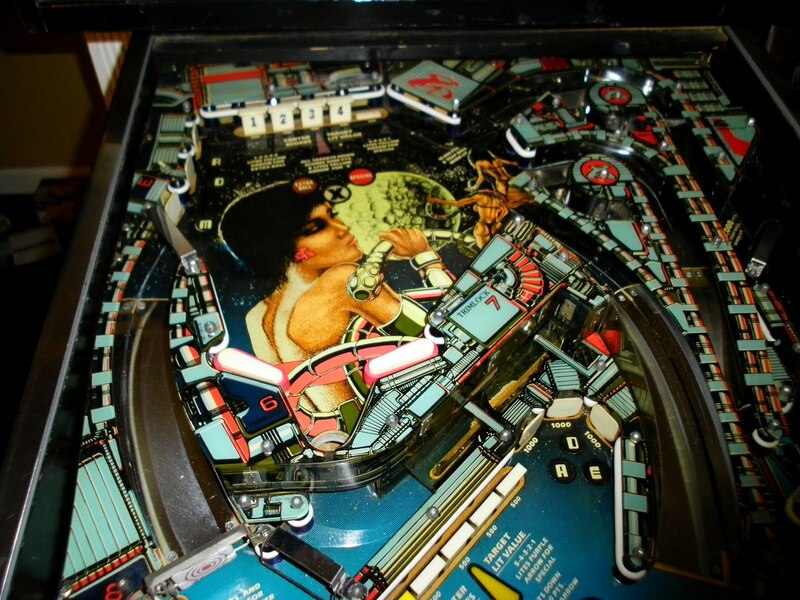 I contacted a guy to make a repro translite for the backglass that week and left it at Zespys for his arcade tech to get it running tip top. There is something about rare games that interest me and I still can't believe how easily I got this one. I expected to be looking out for weeks or months or maybe years for one to pop up. 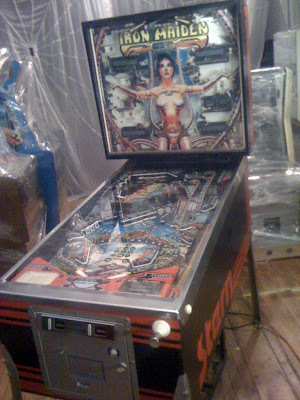 It's an amazing machine, one I cannot wait to play! I was sooooo looking forward to Big Guns!!! Yeah man - sorry about that! 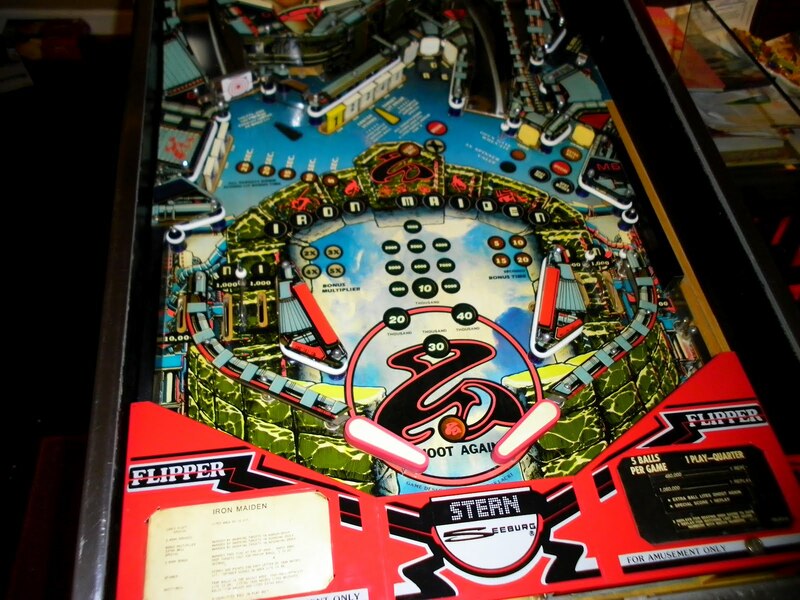 This is a much better game though - one of the best 1980's pinball sound boards and a super fun, if difficult playfield. Mini update - Zespy's tech has got it up and running but not without some issues. Still some work to do before the meet!